DC has an abundance of awesome spots to belly up to the bar with a piping hot pot of moules, a side of sizzling frites, and a stein of your favorite Belgium beer; and little by little I’ve grown quite fond of these baby bivalves (Confession: this Hungry Texan spent a week in Belgium at age 19 and left without nomming a single mussel. She’s still beating herself up for not tasting the beloved dish in its motherland). Until today when I had a craving and promptly started researching how to make them myself, I had two wrong assumptions about mussels. 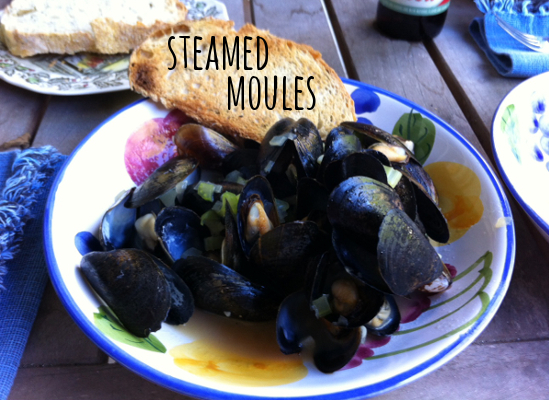 I wrongly assumed steaming mussels was a labor of love, I imagined hours and hours of a slow simmering pot of broth until little by little the shells started peeping open. Turns out the shells pop open in a flash and you can have ’em ready in five minutes flat! Wrong assumption #2 was that mussels were really expensive. ¡Au contraire mon frere! I got a two pound bag at Central Market (the finest grocery store) for $8.99 & that happily fed Baby Bro, Mommy Cat and me. Misconceptions corrected, I read a little bit about making moules in Saveur and then concocted my own Texas-twist on the Belgium classic. The only thing standing between you and your own bowl of steamed moules is 9 ingredients and +/- 20 minutes! This recipe couldn’t be simpler. 5 easy steps. 1. 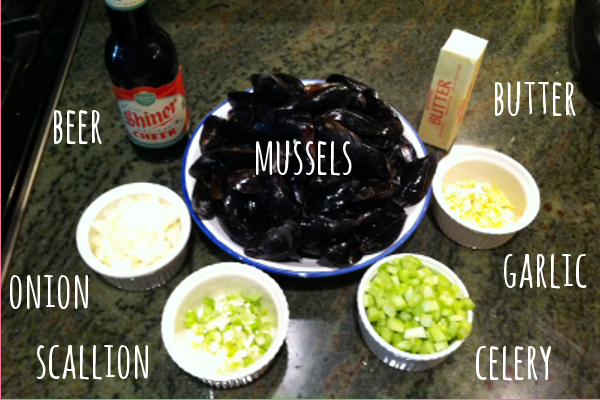 Prep all your veggies & give your mussels a good rinse. 2. Get a large pot with a good fitting lid, place it on the stove and set your heat on high. 3. Melt your butter in the pot & then dump everything in. Add s&p and give it all a good stir, then put your lid back on. 4. Set a timer for 5 minutes and periodically give the pot a good shake. 5. Turn off the heat once you’ve reached 5 minutes or the majority of your shells have popped open. Scoop your moules into bowls and ladle on your broth (don’t forget a bowl for discarded shells!). Serve with your favorite crusty bread and/or frites & mayo if you’re feeling fancy!